This entry was posted on Thursday, January 12, 2006 at 6:12 AM. You can skip to the end and leave a response. I'm Pam, The Deadly Nightshade's bass player. And you're sure right about our version of the theme from "Mary Hartman, Mary Hartman" being a, "WHAAAAA?" kinda cut. It started as a joke. We were playing a Sunday afternoon show at Passim-- that famous coffeehouse in Cambridge where Bonnie Raitt and Bob Dylan played early on--and Anne, our rhythm guitar player, broke a string. Normally, we could've just taken a short break, but Passim used to do a radio broadcast of their Sunday afternoon shows. Five minutes of dead on-the-air space wasn't an option. 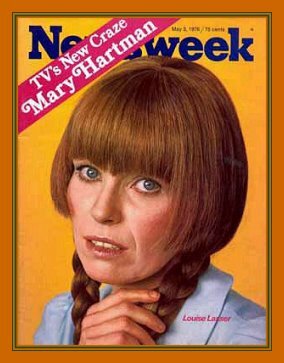 So to kill time, I said that we had an exciting announcement about our next recording; it was going to be a disco version of the theme from "Mary Hartman, Mary Hartman". This was clearly ridiculous, what with us being a country/rock trio-- a very loud one, but still a band with no drummer, much less a horn section, strings, etc. But it served its purpose. The audience totally got into the joke, yelling out fake questions about the project until Anne got the new string on and we went on with the set... and with real life. However, on the drive back to New York, we decided it'd be fun to see how far we could push it. On Monday, we went into Phantom's offices and proposed it as a serious recording project to the label's president, Bud Prager. Well, he actually took it to RCA (which was the money company behind Phantom). And it turned out that, like, 11 other groups had already submitted disco versions of Mary Hartman's theme! RCA was going to make a decision about which one to release by the end of that week. But Bud said we could record our version if we could manage to do the whole thing in three days. So we stayed up for the next 72 hours and did it. Michael Mainieri, a famous jazz player whose band we'd played with in Woodstock, said he'd produce. He brought in all the top studio players he knew, which were... everybody. And the string section from the NY Philharmonic, too. Meanwhile, Helen and I wrote the arrangement. And we also wrote a whole second half to the TV theme-- which is indeed, as you noted, quite depressing. After the original theme plays through once instrumentally, the whole B section, which is much longer and vocal as well as instrumental, is ours from scratch. As well as new music, we wrote lyrics, layers upon layers of them-- the main "Uh huh, ya got me every night, lookin' at you lookin' at me, Mary, Mary", as well as many others that are easy to miss. But they're pretty cute, including some references to Louise Lasser's then-recent coke bust that were subtle enough that they didn't catch them and sticker the record. And we orchestrated the whole thing-- wrote charts for all instruments, including the horns and strings. Studio musicians played it. But we sang it. 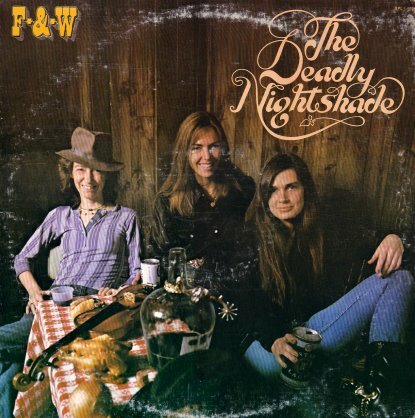 That part wasn't unlike The Deadly Nightshade. We always did elaborate vocal harmonies in our real songs. Anyway, we made the deadline, and RCA picked our version. It did chart as high as 67 nationally, and went top 10 in a few markets, like Miami. It was a little tricky touring to support the record, since naturally we could not play it. But audiences liked our normal stuff, so it worked out fine. Oh, btw: Helen and I never made a cent of writers' royalties even though we did write more than half the song from scratch. And we weren't credited as co-writers, either. That's because in all the rush to record and release the thing, Phantom/RCA didn't negotiate for any writers' rights. By the time that came up, it was either sign away all our rights to money and credit, or the record doesn't get released. So we signed.